Since Hammer’s first delves into horror sci-fi in 1955, the studio had increasingly set itself down the route of gothic tinged, cold war efforts. From The Quatermass Xperiment (1955), X the Unknown (1956) and then Quatermass 2 (1957), it seemed the studio’s output was already becoming defined, perhaps even predictable. Its fourth film after the horror surge can therefore be considered a curve-ball, especially for its heightened moral message, its folkloric roots and its desire to do more than simply scare. Val Guest’s The Abominable Snowman (1957) is an astonishing film for its budget. The sets and camera work are exceptionally good, creating the snowy outback of Tibet in an effective albeit pulpy manner. 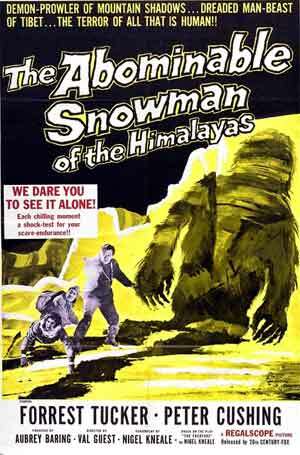 In a nearby monastery, Helen (Maureen Connell) and the High Llama (Arnold Marle) are trying to dissuade Dr John Rollason (Peter Cushing), a scientist who studies mountainous plants, from heading up the mountains with the suspicious Tom Friend (Forrest Tucker) in search for the elusive Yeti. 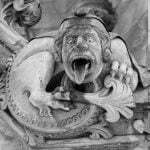 The moral implications are relatively simple but effective as its clear Friend only wishes to exploit the creature when it is found while Rollason merely wishes to study it as scientist in its natural environment. When the creature does show up, it is surprisingly effective – after tension is built from the findings of footprints and a tooth owned by the High Llama, the presence of the creature (and also other figures, whose presence on the horizon line is eerie but also unrevealed in this article) is a gradual and unnerving one. As the camp settle in for the night, the site represents a wonderfully cosy base-under-siege scenario which is continued for the rest of the film, only moving in location. The yeti’s presence is felt strongest when only the claw of the creature comes through the tent, though its later reveal shows the creatures themselves to be far more human-like than would be expected from Hammer. With this in mind, its questioning becomes about exploitation and wealth instantly – while one of the yeti is killed by Friend, it meaning the others want to rescue it back, the creatures seem more like a bereaved family towards the end of the film. This allows Peter Cushing to really shine in a desperate, morally outraged role and it is always a great pleasure to be in the company of the actor when playing a non-villainous role. The support is also great with Tucker being a particularly delicious villain, greedy for the commercial showbiz future the yeti appears to open up for him. Coming after the trio of cold war sci-fi pictures, The Abominable Snowman must have seemed like a very definitive left turn. While it seems to be one of the few oddities in the Hammer canon, not seeming to fit into its early horror period or its latter gothic period, it stands as one of the studio’s most affecting and intelligent dramas.